Rehub is an awesome dynamic, modern, retina-ready and ultra-responsive multipurpose hybrid WordPress theme designed to help you easily run a website for yourself and clients. With this theme, you can easily create a standard blog, magazine, directory, online shop, coupon, review, and affiliate website. The theme features a clean, professional design loaded with unlimited powerful affiliate options. Rehub is the perfect theme for making money online. It’s built with unique designs and offers unlimited options for affiliate earnings, coupon, review site, directory and comparison sites. Rehub supports WooCommerce for a creation of powerful online store and bbPress for a building of online community. It offers 5 different design layouts for WooCommerce to stylishly showcase your products. The theme works with affiliate networks such as Cj, Amazon, Ebay, Zanox, Linkshare and much more. The theme is loaded with top review list conductor, top tables constructor, top charts constructor and catalog constructor. It has tons of beautiful shortcodes such as Ajax categories archive, reveal buttons, countdowns, price tables, offer lists and much more. The well-designed custom drag-n-drop theme Visual Composer allows you to easily make an adjustment to the general layout of the theme and add extra features such as pricing tables, icons, buttons, shill bars and more. Rehub fully supports CE and AE plugins that can make your content be human and search engines friendly. 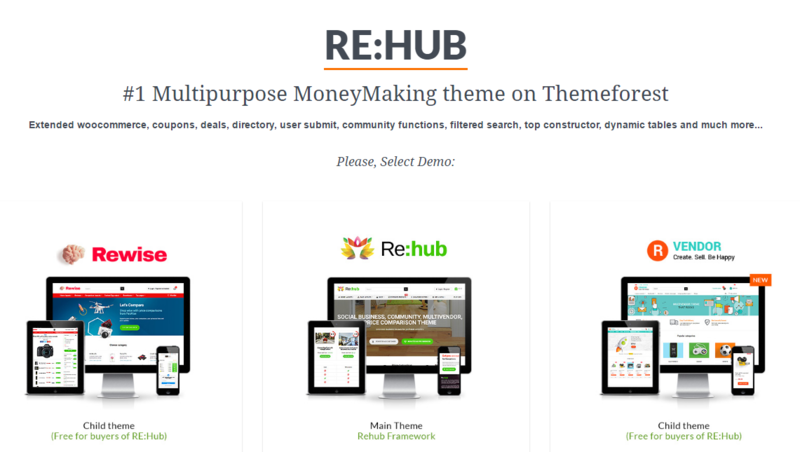 There are tons of features that make the Rehub theme the ultimate tool for running affiliate site.